Storybook Link-Up - HAPPINESS IS WATERMELON SHAPED! Saturday is such an amazing day! So far today I have walked my dog, organized some of my correcting, went spinning and ate oatmeal for breakfast. Now I'm finishing my coffee and blogging. What a great morning so far! 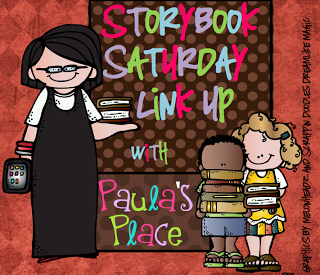 Back to business - I am linking up with Paula for her Storybook Saturday Link Up! This non-fiction books tells about a place in China that takes special care of panda moms and their cubs. Panda moms care only care for one cub so if there are twins, one gets ignored. Not at this place - the special people take care of the other panda while the mom tends to the other cub. Then the people switch the cubs so that they both get what they need from the mom. When the pandas are old enough, they go to kindergarten where they get to play outside on equipment; they even have rest time! My students were crazy for this book! Now they all want a turn to take it home. You know it's a winner when that happens. 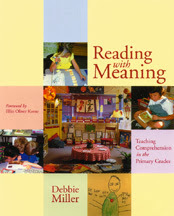 Another professional book that I have found extremely useful is Reading with Meaning by Debbie Miller. This book gives ideas for reading mini-lessons and lists of books to use to teach reading strategies such as how to better understand what you read; using prior knowledge; etc. I have found this book to be very helpful. On top of that, I sent in my registration to go to a presentation by Debbie Miller on November 7th in Dedham, MA. I am so excited to see and hear her speak - I just hope that I got in. Here's a very helpful link that outlines mini-lessons and combines information from The Daily Five, Reading with Meaning and Growing Readers. Have a wonderful weekend checking out all these great books! It sure is a fantastic Friday! Wonder What We're Working On Next Week? Saturdays And Storybooks Always Make Me Smile! Storybook Saturday/Check Out This Giveaway! Take a Peek at the Week Ahead! October is currently in session!